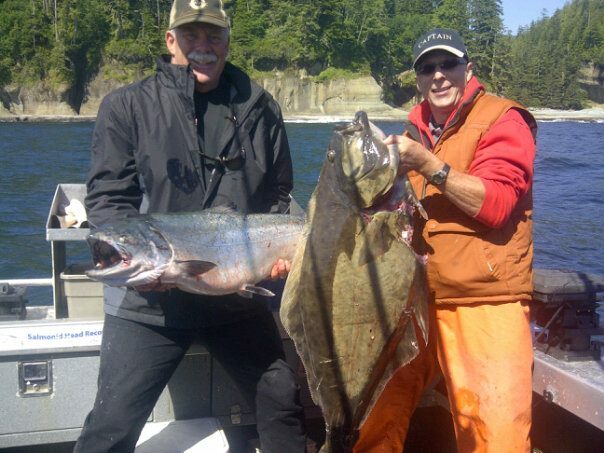 Fishing in Port Renfrew so far in August has been pretty good. Some days have been slower than others, but on its day, the fishing has at times been absurdly good on the Beach. No Bananas Trevor passed on this report earlier this week: “Wow what a day on the water!!! Flat calm warm and a all day bite on the beach!!! Did a quick charter from 530-10 am and limited out by 8 am then back at it 11-330 had two triple headers a double and some singles mixed in! !” The next day, he caught 12 springs … with Walbran the hotspot, in the afternoon, on the flood. There’s been good reports from East Point as well and the word is out … about 30 boats on it at 6am on Friday! Swiftsure Bank has also been doing its magic, with limit catches of midsize spring salmon and smaller halibut caught driftfishing, or a little bigger on anchor. The photo is from Swell Time Charters … Frank and Murray’s catch of the day. Get out to Port Renfrew and get in on the fun! This entry was posted on Sunday, August 19th, 2012 at 3:59 am	and is filed under Uncategorized. You can follow any responses to this entry through the RSS 2.0 feed. You can leave a response, or trackback from your own site.